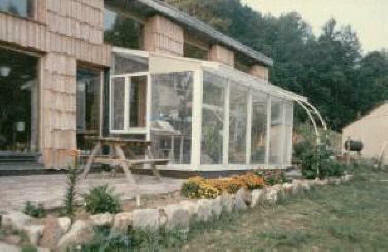 My attached greenhouse is 8'x18', and attached to the south side of my solar heated home. 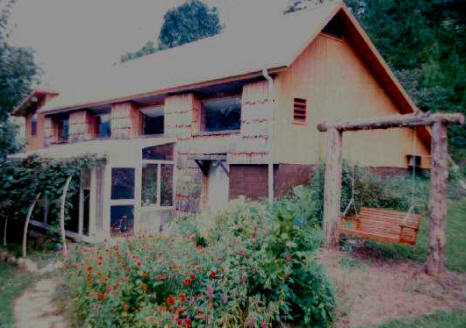 I built both in the mid 80`s, for little money. 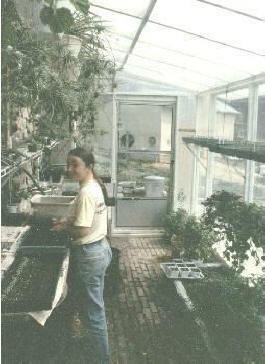 The greenhouse initially cost me about $300 to build, but it was single glazed then. I started out by pouring a footer, and laying up 6" blocks, which I then externally covered with 2" of foam board, topping it off with an 8" treated sill plate. I had found some 46"x76" sliding glass door replacement tempered glass for $15 each, so I framed walls with 2x4`s to fit them. I initially used corrugated fiberglass for the roof, it lasted about 10 years, then I replaced it with twinwall polycarbonate, which is much better. I have a pea gravel floor over the soil, a scrounged brick pathway, and four 55 gallons drums of water for thermal mass. The drums support benches, and are along the house wall. The attached also is an airlock in the winter, as it covers an entrance door, which we open in sunny cold weather to help heat the house. It is a handy place for firewood, and the dogs stay there on winter nights. I also installed an exhaust fan thru the adjoining wall , which I wired to an AC thermostat, so it can come on at about 85*F greenhouse temp to blow warm air into the house, useful when we are not home. The adjoining wall also has a window with a lower vent space below it, when we are not going to be home during sunny cold weather, I removed the insulated cover to the vent, so air can be returned to the greenhouse from the house, it has a 4 mil flap on the greenhouse side to prevent reverse flow. I have large screened vents in both east and west ends for warm weather ventilation. I made extruded foam board inserts to block them off in winter. In summer I cover the roof with 60% shade cloth. The greenhouse provides heat, acts as an airlock, provides a place to grow food and house plants, it helps us earn a living by providing a place to start plants to sell, it is a great place to hang out in sunny cold weather, all in all, we really like it. Thanks very much to Doug for providing this material!